We provide free custom artwork design for your orders! Don’t waste your time with stock art and the clumsy self-design programs on other sites. When sites have a "design-it-yourself program" (that you have to be a genious to figure out), basically they are saying "you do the work...or we'll charge you". Instead have a unique removable bumper sticker or magnet custom designed to your exact specifications by a professional graphic artist…it’s FREE! No kidding, we’ll design your removable bumper sticker or magnet for you…unlimited proofs…and no upfront/down payment needed to get started! Only when you approve the design and want us to actually produce your sticker or magnets, will we ask for payment. Sending us your artwork. If you do plan on sending us artwork files, vector format (AI, EPS, PDF) is always recommended for optimal printing. Make sure to convert all text to outlines/paths prior to sending us your artwork files. Raster (JPG, PSD, TIFF) artwork may be accepted as well. The resolution for raster artwork should be set at 300 dpi or higher. 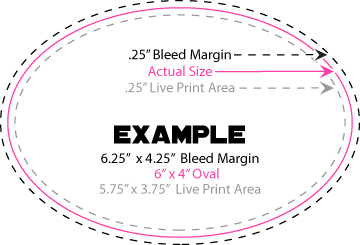 See the example to the right for the appropriate bleed and live print margins. We will always send you a proof of your artwork on our templates prior to any production. How to send us your artwork. You can upload your artwork when placing an order on our website. Or click here to upload artwork files to us now.